You’ll never have seen anything like these New Caledonia ferns in New Zealand, unless you’ve been to a very interesting garden (which I’d love an invitation to!). These are photos from my recent fern collecting trip. Dipteris conjugata. This is a very distinctive species with its un-fern like, c. 1 metre wide fronds. It is can be common on sunny, roadside banks. The same species occurs in south-east Asia to Australia and Fiji. The closest relatives in New Zealand – and it is a distant relationship – are Gleichenia, Sticherus, and Dicranopteris. Photo Leon Perrie. © Te Papa. Dipteris conjugata. 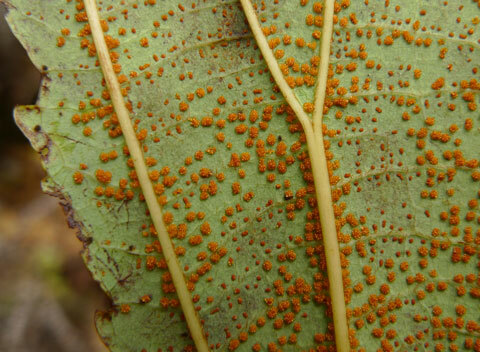 The spore-producing structures (sporangia) occur in clusters (sori) spread over the underside of the frond. Photo Leon Perrie. © Te Papa. Austrogramme marginata. You can be forgiven for thinking this is an Asplenium birds-nest fern. But the resemblance is only superficial, and it is actually in the Pteridaceae family! 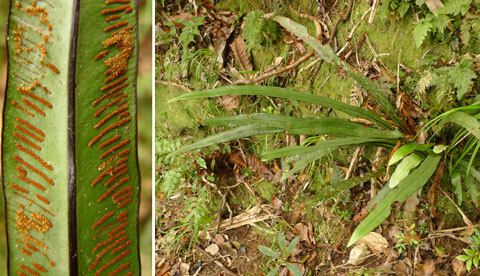 The closest relative in New Zealand is probably Anogramma (and/or Pteris). Photo Leon Perrie. © Te Papa. Drynaria rigidula. 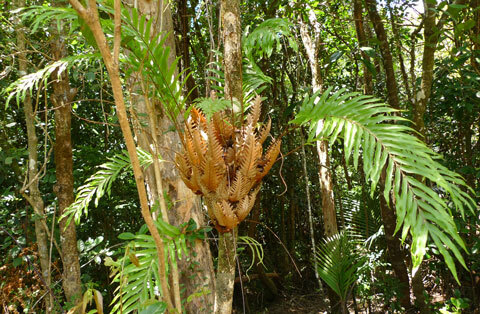 A so-called basket fern. These are epiphytic ferns that have some of their fronds modified (centre of the photograph) to catch litter and organic debris, which on decomposing provides nutrients to the plant. Widespread through south-east Asia and the tropical Pacific. The closest relatives in New Zealand are Pyrrosia and Microsorum. Photo Leon Perrie. © Te Papa. Prosaptia contigua. Looks a bit like New Zealand’s Ctenopteris heterophylla except the reproductive structures are clustered into cups at the apices of the frond segments. Widespread through south-east Asia and the tropical Pacific. The closest relatives in New Zealand are Ctenopteris and Grammitis. Photo Leon Perrie. © Te Papa. Stromatopteris moniliformis. 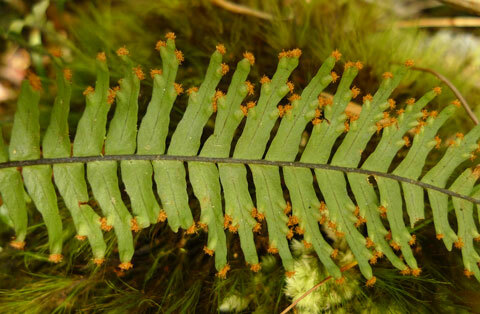 A fascinating fern for anyone interested in fern evolution. 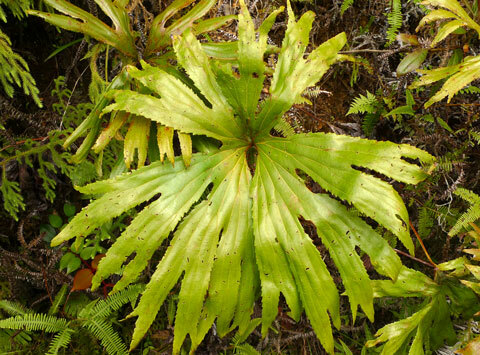 This is the only species in the genus Stromatopteris, and its relationships were intensely debated. 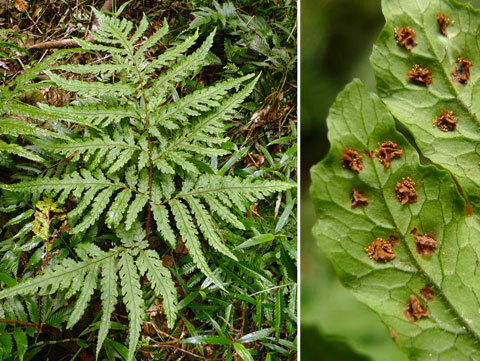 Now classified in the Gleicheniaceae, along with the following genera found in New Zealand: Dicranopteris, Gleichenia, and Sticherus. I saw Stromatopteris only in the maquis vegetation, where it was one of very few ferns present. At the base of the image on the left is a young Dracophyllum. Photo Leon Perrie. © Te Papa. Selaginella hordeiformis (?). 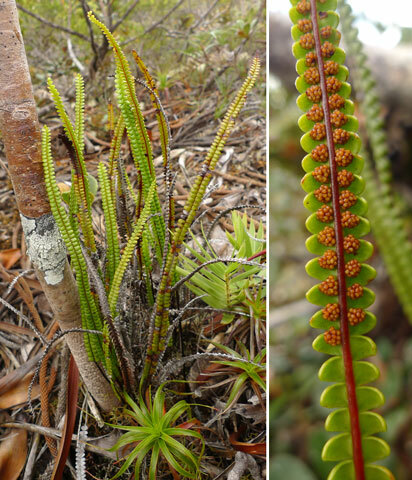 A lycophyte rather than a fern. No Selaginella are native to New Zealand, but misfortunate conservationists and gardeners may be familiar with the introduced Selaginella kraussiana. Despite the latter’s diminutive stature, it carpets the floor of wet forests (and gardens), choking regeneration. 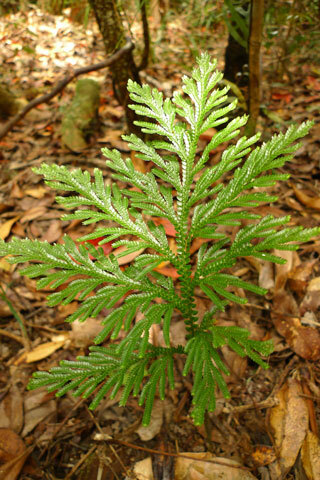 New Caledonia is home to several Selaginella species that produce erect ‘fronds’, although none as big as Fiji’s Selaginella viridangula which can be over 1.5 m tall! Photo Leon Perrie. © Te Papa. Tectaria sinuata. New Zealand is seemingly too cold for this large group of ferns. The closest relative in New Zealand, is believe it or not, the epiphytic Arthropteris. Photo Leon Perrie. © Te Papa.